TypeRocket 4.0 makes adding theme options for WordPress simple. Add any number of custom fields you want. TypeRocket works as a theme options framework for WordPress by providing the custom fields you need to customize your themes. To get started all you need to do is enable the theme-options plugin in the TypeRocket configuration in the file config/app.php. Theme options are commonly used to manage the global elements of a WordPress theme's design. These elements could be as simple as the copyright information at the bottom of every page; to API keys for Google Maps or Facebook Sharing. 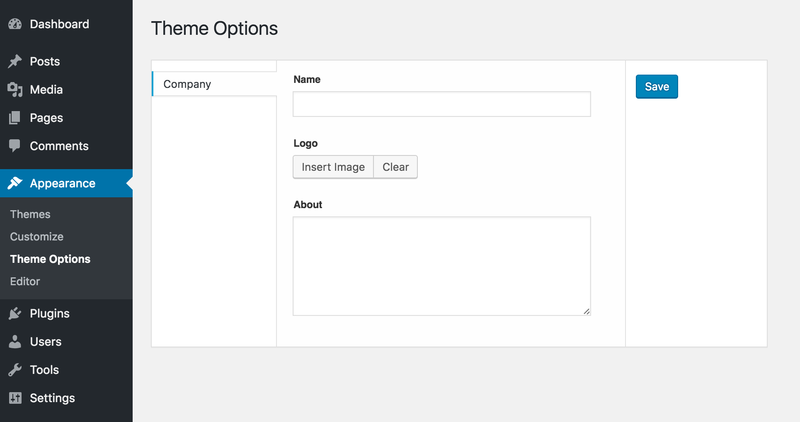 Out of the box, the theme options plugin comes with its own template file named page.php. You will need to override this file. Duplicate the page.php file located in ./vendor/typerocket/plugin-theme-options/. Place the new file in the root of your custom theme's directory. If you want to start from scratch delete the code inside the file. Next, you need to let the theme options plugin know that you are going to use theme-options.php as the new admin page. To wrap up configuration, change the theme options name with the filter tr_theme_options_name. Now, let us start with the bare minimum. Use the code below as the contents of the theme-options.php file. If you have debug mode enabled you will see the export/import feature at the bottom of the page. Otherwise, the code hints and export/import will be removed. With debug mode enabled you can copy the code hints into any theme template file. Finally, you can get the basic field types into the templates: Text, Image, and Textarea. For text fields, a using echo will work just fine. However, don't forget to sanitize all user entered data on output. If you decide to use advanced fields like repeaters and galleries you can use var_dump() to inspect the fields.